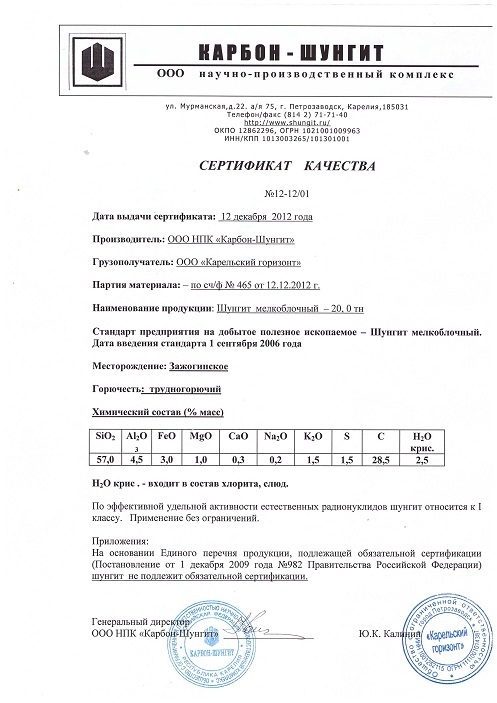 TU 5714-007-12862296-01 "Crushed and ground shungite of Zazhoginskoe deposit for consumer and industrial application"
SP 2.6.1.758-99 "Radiation Safety Standards (RSS-99)". SanPiN 2.1.4.1074-01 "Drinking water. Hygienic requirements for quality of water from centralized drinking water supply systems. Quality control". GN 2.2.5.1315-03 "Maximum allowable concentrations of chemicals in the water of water bodies of domestic, cultural and general water consumption". Expert advice №27 of 11.09.2007, FGUZ "Center of hygiene and epidemiology in the Republic of Karelia". For domestic and industrial use. Enterprise standard for extracted mineral - Shungite building block. H2O crys. – is included in chlorite, micas. Shungite refers to I class by the effective specific activity of natural radioactive nuclides. Application without restrictions. Shungite is not subject to mandatory certification according to the Unified list of products subject to mandatory certification (Decision of the Government of the Russian Federation No.982 of December 1, 2009).